This week, the news broke that Marvel's series of X-Men titles were getting reinvented in April under the banner of "ResurrXion," an old-school approach to rounding up our favorite heroes on teams like Uncanny X-Men and Extraordinary X-Men. One of the heroes not on either roster is the adult version of Iceman, Bobby Drake. Although adult Bobby (his time-traveling teenage incarnation is on the X-Men: Blue team, along with his other time-displaced classmates) is a "free agent" of sorts, this won't stop him from starring in his first ever ongoing solo series, a momentous event for the character, who has been a mainstay of the Marvel Universe since 1963. The new ongoing Iceman series will debut next spring from the creative team of writer Sina Grace (Self-Obsessed, Not My Bag) along with interior artist Alessandro Vitti (Secret Warriors) and cover artist Kevin Wada, whose promo art for the new series you can see below. Although he's one of the original X-Men created by Stan Lee and Jack Kirby, Iceman was seen until recently as the X-Man who had changed the least since his first appearance. Over the decades, Bobby's four other "O5" teammates saw their share of evolution. The Beast mutated into a blue and furry creature, Jean Grey became the godlike Phoenix, Angel became the razor-winged Archangel of Death, and Cyclops became a militant political leader. All the while, Iceman pretty much just stayed "that jokey dude who could make stuff out of ice." 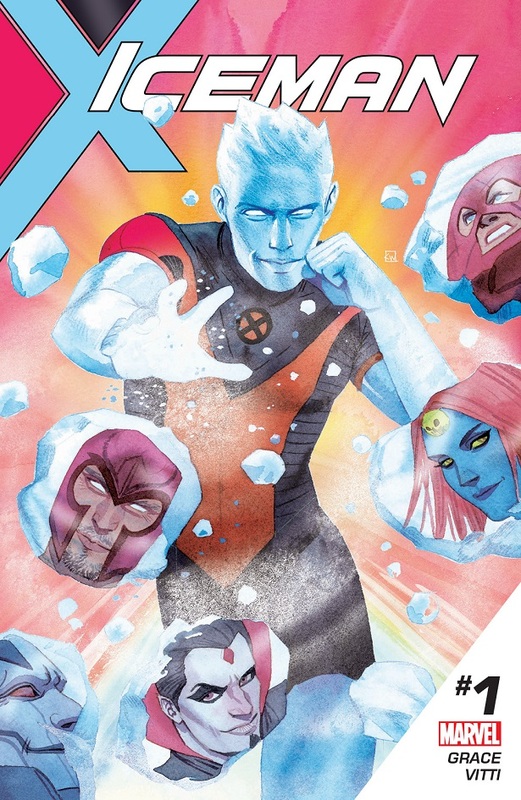 But, as was revealed last year in Uncanny X-Men #600, it turns out Iceman had been hiding the fact that he was gay. I recently got the chance to chat with series writer Sina Grace and series editor Daniel Ketchum about Iceman finally earning the spotlight, and what to expect from his first ever ongoing series. LGBT comics fans had long suspected that Bobby Drake was gay, based on evidence from years of X-Men stories. In fact, editor Daniel Ketchum confirmed that these years of fan theories played heavily into Marvel officially outing Bobby for real. "I wasn't involved entirely in the story at that point," Ketchum said. "But [former X-Men writer] Brian Michael Bendis was very wise to identify that all those threads that existed. We're not in the business of pulling something out of nowhere and slapping it on to a character so he fits some quota, or for the sake of telling some story. This had to come from somewhere, and it did. And now wonderful talents like [series writer] Sina Grace get to take that storyline and move it forward." Grace added, "I think the tension of this is what makes this the most interesting and fun project to work on. Because it means that he's been keeping something not only from his friends and colleagues, but also from himself. And if you even just look at his powers, it's always just sort of been there, for the entire history of the Marvel universe. And leaning into it makes working on the character and understanding all the decisions he's made to date that much more fascinating. And what he does with that information moving forward is going to inform not only his personal life, but also how he sees himself as a hero." Despite being one of Marvel's fabled "Twelve" (their upper echelon of the most powerful mutants), Iceman has never really seemed all that powerful. Sometimes his powers are crazy and off the charts, but most of the time they're just kind of adequate. On the subject of whether or not the new Iceman series would definitively address Bobby's power levels, Grace said, "With this series, you'll see how much knowing yourself and understanding yourself helps inform the scope of your abilities, both as a human being and also as a superhero. We are gonna play with it to be sure, because this guy is an Omega Level mutant at the end of the day." And just how does Bobby Drake see himself as a hero? Despite being considered an "Omega Level" mutant, he's never fulfilled his true potential. According to Grace, "Bobby realizes that he's been around the X-Men longer than just about anyone. And the legacy he's built for himself is [that] he tells jokes and he makes stuff out of ice. And he hasn't left much of legacy as a hero, or built much of an identity for himself. And that's the mission statement of the book, that Bobby realizes these things about himself, and is striving to become a better hero and leave a better legacy behind." But just because Bobby Drake is going through this big life change at the moment (an even more profound change when it happens later in life than when you are an adolescent), he's still going to be the wisecracker we've known for years. Ketchum said, "We're not going to lose sight that Bobby's always been the comic relief, funny and jokey character. He's not a 'Gold Star Gay' [a gay person who has never had heterosexual relationships]. So we're going to be seeing a funny moment where he sees one of his exes. I really want Sina to put in the line, 'So what was I, just your beard?' There's going to be an acknowledgement of it, but it's gonna be played off in the tone that Bobby usually does. But Sina will bring a real authenticity to it." As fans know, Iceman has dated Polaris, Opal Tanaka, and most recently, Kitty Pryde; all these relationships just sort of fizzled out, leading many fans to speculate over Bobby's orientation. "Yeah, this part of his identity is going to effect the people around him, including some of his ex-girlfriends," Grace said. "Part of the story and the adventures he has moving forward include the space where he does have a very touching interaction with one of the ladies, and we might have some more sprinkled in when it's organic to the book. But that's something that everyone can relate to, when you're holding onto something for a long time, and that decision can have an impact on everyone around him." (Who that first ex of Bobby's is remains to be seen, but my money is on Kitty Pryde). Iceman #1 hits comic shops in Spring 2017. Are you excited about Bobby Drake finally getting his own ongoing series? Let us know your thoughts down below in the comments! Could Wolverine's claws cut Superman?